It may seem quiet at Khargo recently but we haven't been twiddling our thumbs - Ke has been working hard creating a Studio Gallery for the awesome talents of Ocean Mureaux. Ocean creates amazing portraits morphing SL avatars into RL photos with fantastic results. Check her out at Ocean Photography inworld or online at her flickr. 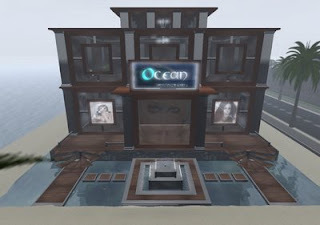 Ocean's Gallery is a custom build with 2 levels and landscaping out front including a specially created fountain. The whole build is scripted with lighting to create the right atmosphere and upstairs in the studio the windows have blinds for a sense of privacy. The Studio floor has a lantern roof to create a higher ceiling and let in more light while the freestanding easels give some character and display Ocean's creativity in a more informal setting. The Gallery floor has a waterwall at the back which flows into a floor rill giving the space some movement. The floor itself is stepped down which lends prominence to the portraits on the walls. The lighting is highly adjustable with many colour options and 3 power settings making mood settings a breeze. Behind the desk is a custom created panel with online indicator, landmark giver and a link to Ocean's Flickr where all her portraits can be viewed.